The first thing I thought when I saw the Curls & Coils Necklace at Anthropologie was, ooo cute! Then the next thing I thought was, I can totally make that. But more importantly, I can totally make that for 1/8 of the $42 price tag. The original design (shown left) was also a little large for my liking, so I was excited to modify the concept to my daintier and more structured tastes. And while I love the nautical fashion style, I have yet to really jump in, so this piece felt like the perfect place to start. 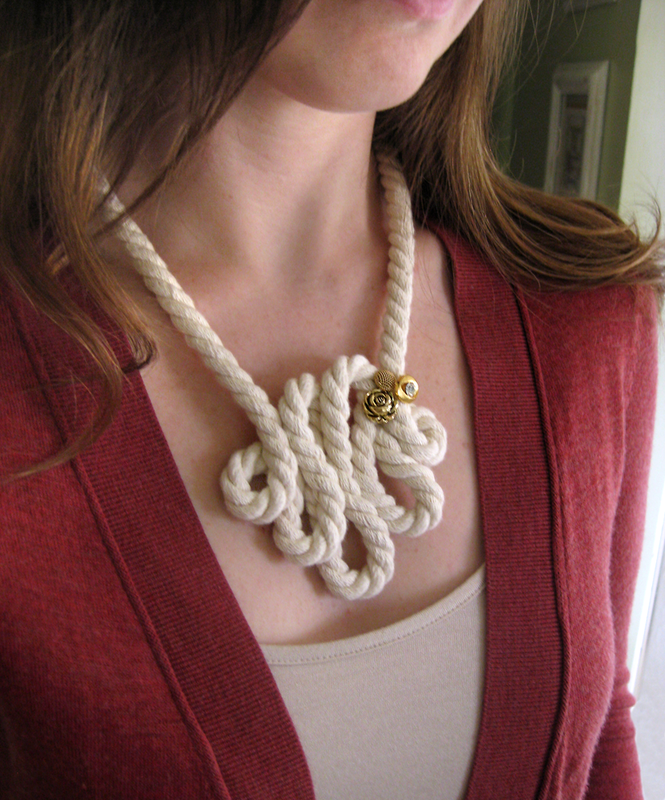 At first glance, the necklace looks to be made of rope, but upon inspection I realized it’s actually made of soft cotton piping cord used for upholstery, which is much more pleasant on your skin than rope would be anyways! 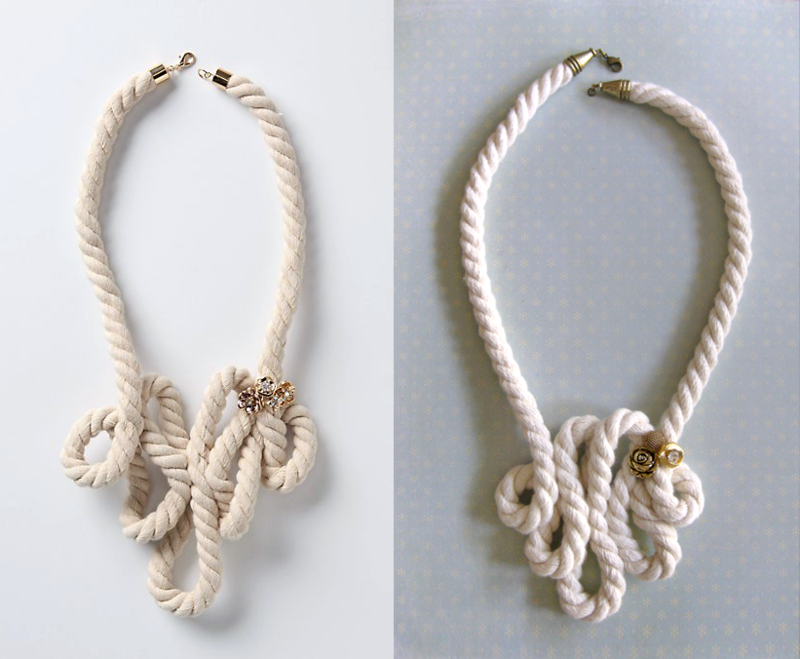 A few basic materials and less than an hour of time are all you need to create your own Curls & Coils Necklace. 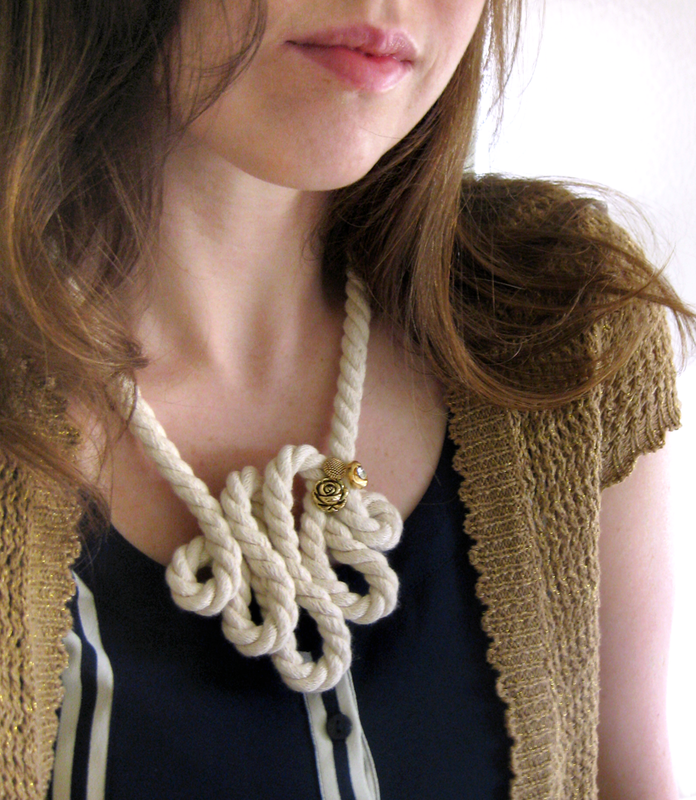 While I used the same raw cotton style cording as the original necklace, you can find many sizes, colors and materials that would work equally as well. I especially love the satin cording and picked up some in a lovely mustard yellow that I think will be just awesome! 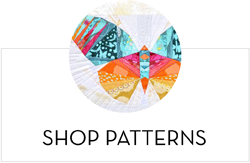 I purchased all my materials at JoAnn Fabrics. Begin by approximating your loop pattern and determining how much cording you will need. For reference, I used a 1.5 yard piece and had about 4″ left on either end when I was done. Better too long than too short! Be sure to leave a long enough tail before you start sewing your coils. Starting and ending on the back of the necklace, begin tacking your loops in place with a few stitches. It doesn’t take much to hold it together and if you place the stitches in the ‘grooves’, you can’t see them at all. 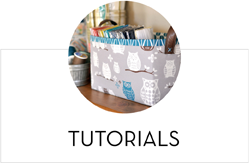 Next, decide on an arrangement for your embellishments and stitch them in place. I wanted mine a little less ‘blingy’ than the original so I used a plastic rose shaped button along with a simple gold metal one and one with a small rhinestone. 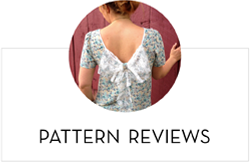 Once you finish sewing the loops and embellishments, determine the length you’d like the necklace and trim the ends about an inch shorter to account for the length the clasp will add. To finish the ends, I used brass cones that I also found at JoAnn Fabrics. 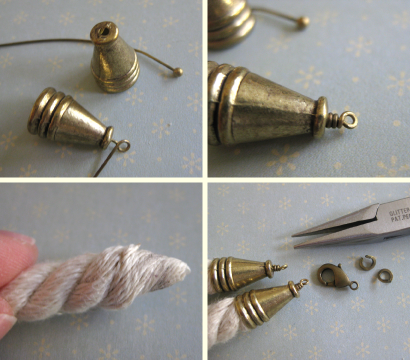 Using a ball end head pin or a piece of wire, fashion a loop on both cones for attaching the clasp. 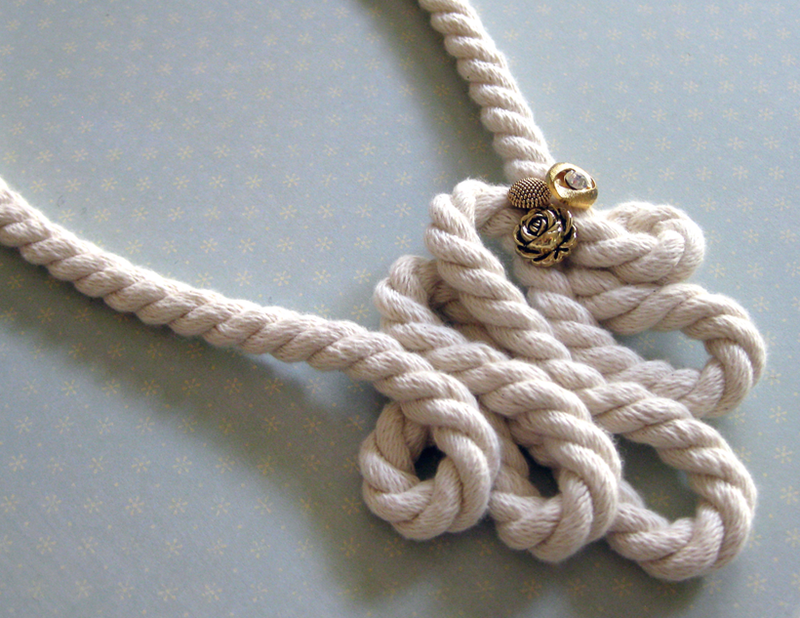 Apply a few dabs of craft glue to the end of the cording and begin twisting into a point. 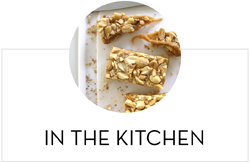 Warning – this will make your fingers messy! Allow the glue to begin drying a bit and then continue shaping. You can also twist the cone onto the end to help shape it. Once you have a good point, apply a little more glue then twist the cap on, getting all loose ends tucked up underneath. 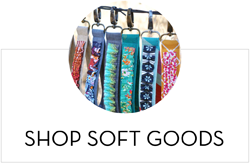 Add your clasp and voila! 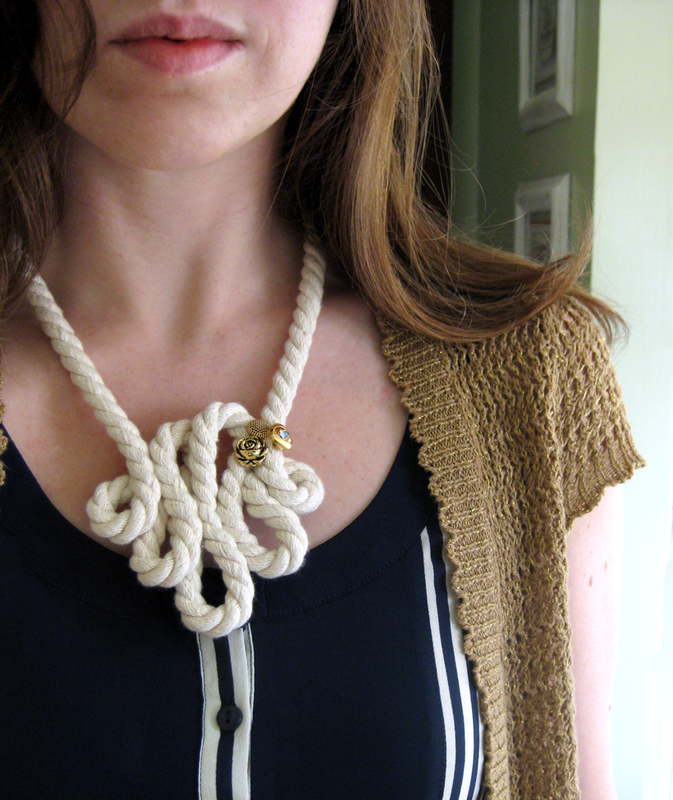 Liven up a simple cardigan or sun dress or accent a nautical striped tank top. Soft and lightweight, this necklace is the perfect year-round statement piece! 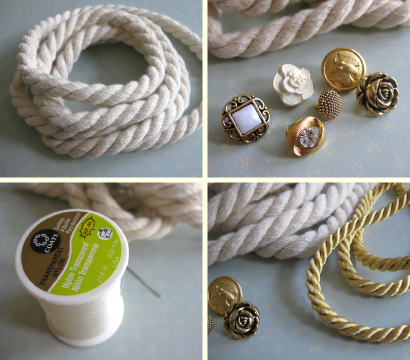 You can also apply this idea to other accessories such as a bracelet or belt – get creative! I’d love to hear if you try your hand at this project and how it turns out. Happy crafting! That is fantastic! Great job adapting it. I think I am going to make one myself. 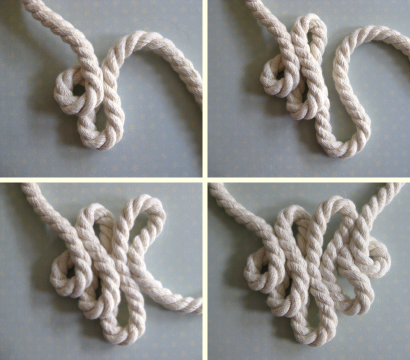 You have the best tutorials- I have been obsessed with sailor knots lately! & now I have to go make one too! Thanks for sharing! 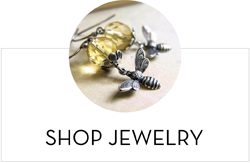 Very Cool necklace and the fact that you shared! Wow, spot on Nicole! And super super cute!! that is super dope! you're so creative!! I love this necklace and great tutoria. I featured this today. Grab a button from my blog if you like. Gave this one a go for myself, I made my loops a little more defined and not so squished but I love the idea of a SUPER cheap necklace. I blogged about it with a trace-back to your post.